A monument commemorates all animals who have served our nation in times of war and peace and recognises the sacrifices and deeds that animals have undertaken in battlefields around the world. 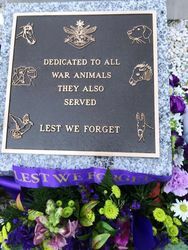 A new memorial to Australian war animals was unveiled at this year’s Narooma Anzac Day ceremony with 100-year-old George Findley was given the honour of doing the official unveiling by the Narooma RSL. 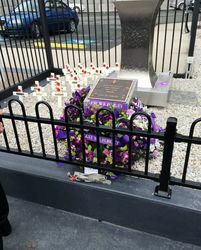 Narooma RSL sub-branch president Paul Naylor said the memorial came about after the sub-branch began communicating with Nigel Allsopp, who advocates for Australia’s war animals. Mr Naylor in his Anzac Day speech said more than 8 million animals perished or wounded on both sides of the conflict on World War I alone, with millions more killed in World War II. This included horses, mules, dogs and pigeons. In more recent times Coalition forces in Iraq used pigeons to as chemical warfare detectors. The Narooma RSL has decided to donate all profits from next year’s Red Poppy Ball to the Canine Carers group, which looks after dogs returning from Australia’s campaigns overseas, as they allegedly receive no assistance from the Department of Veterans Affairs, he said. Mr Findley, who recently celebrated his 100th birthday at the IRT retirement village, was swamped with well wishes and people wanting a photo with him after the service. “It certainly was an honour to do this and very unexpected actually,” he said. 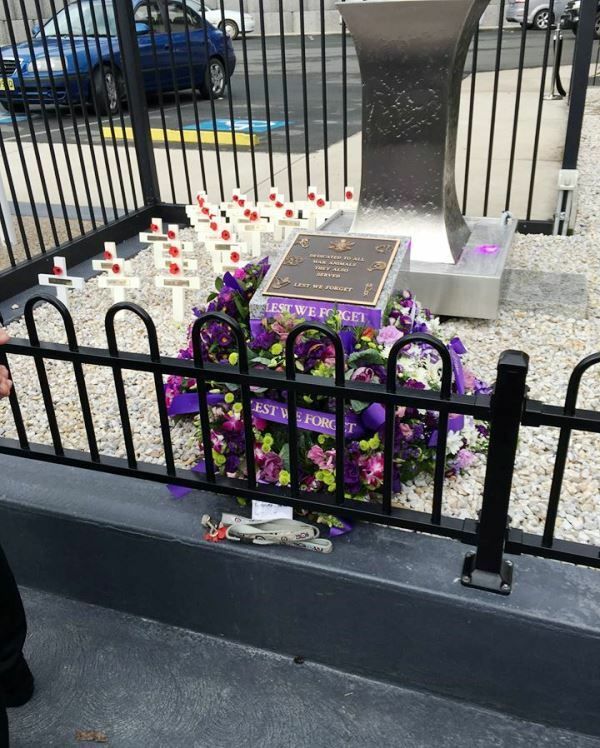 Members of the Eurobodalla branch also laid wreaths and paid tribute to the fallen animals at the new memorial, which is located at the base of the fountain at the RSL memorial garden. The lights will also be turned from red to purple in honour of the animals.